The Chariot stands for combined powers, ready to move forward. It represents the dynamic principle and the human will to proceed, the ability to use the powers of life and keep the outer and inner balance. 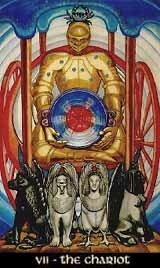 The Chariot shows a strong will, a strong personality, and at its best, victory and success. But it also is a symbol for controversial power, for contradictions that are not solved, but just controlled. In this, the trump also warns of overestimation and recklessness. With every new venture or beginning one should check carefully whether the desired goal is compatible with one's life and inner self. Additionally, the Chariot is a symbol for the armor we build up when moving forward in the process of self-assertion. It also alludes to the danger that we might mix this armour with our actual personality. So a negative aspect of the Chariot might involve understanding that the way of armed power isn't always the right one, that the controversial power inside may to be reconciled with one other, and not just controlled and surpressed.